We have received numerous comments about the login process SO we are providing frequently asked questions and a step by step tutorial on how to work your way through the maze of screens. The step by step tutorial displays pictures of the pages throughout the process to enlarge the pictures hover your mouse over the picture. We hope this helps and welcome feedback. Please send questions and comments to info@bluewave-aquatics.com. Login or create account on BWAQ's Club Assistant Site Quick Links should match the page title you are on in the registration process. Click on the quick link to jump to that pages tutorial. United States Masters Swimming provides our secondary insurance and is required for all Tri Time swim lesson members and all Blue Wave Aquatic members. 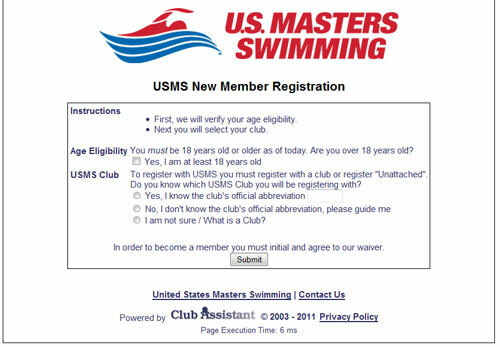 Complete this screen - if you select 'No I have never been a member' continue to the next screen If you are or have been a member of USMS select 'Online Registration' on the quick links. Your form will be shorter than the form shown but it will request basically the same information. Blue Wave Aquatics and it's subsidiary Tri Time Swimming are both Master programs. Masters simply means adults 18 years and older. 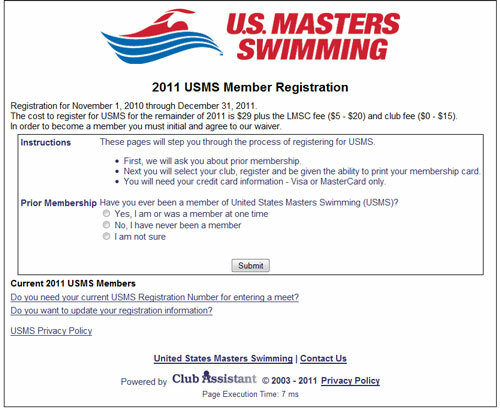 This online registration form registers you with USMS. The current fee for USMS may be found on our Fee Schedule page. 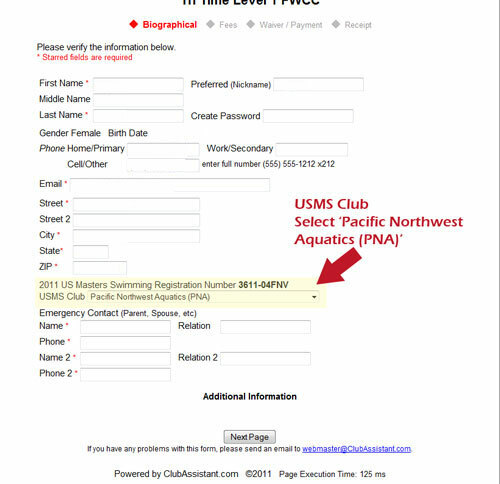 Registration with USMS is required for Blue Wave Aquatic members and Tri Time swim lesson members as it is our secondary insurance. 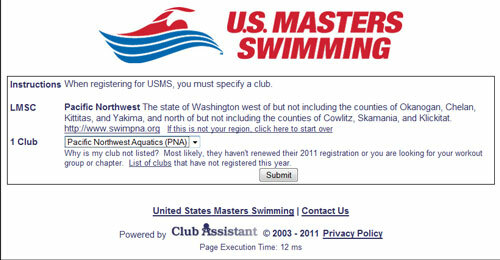 Registration with USMS allows you to compete in USMS meets locally as well as nationally. 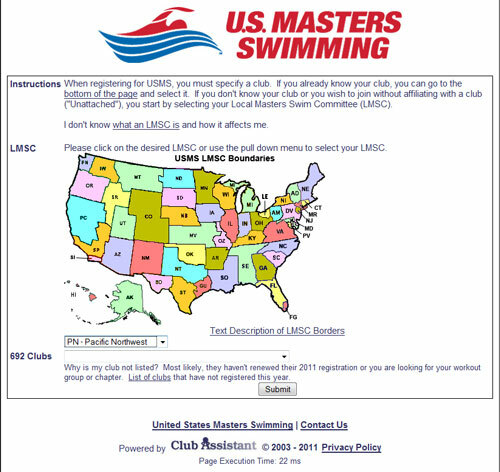 They have a great website that offers information on master swimming, tips for improving and they send out a newsletter. To find out more about USMS visit their website. You should end up here! 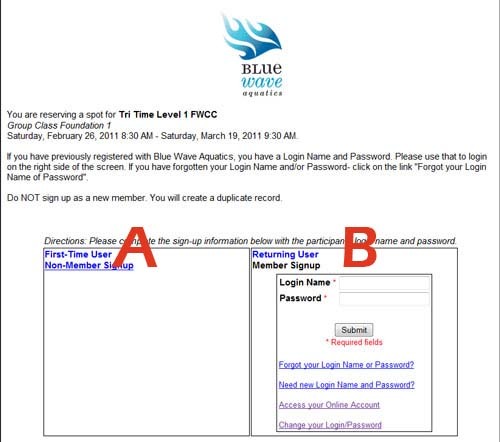 This is the registration form for Blue Wave Aquatics. 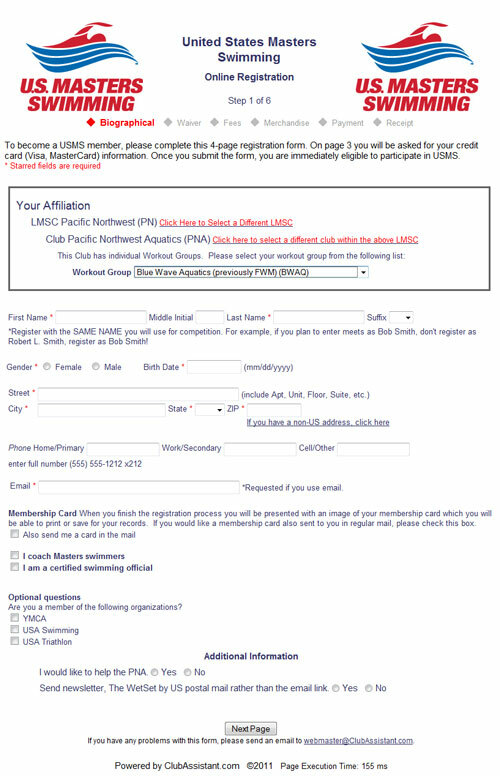 Complete the form verifying that PNA - Pacific Northwest Aquatics is selected in the drop down box. 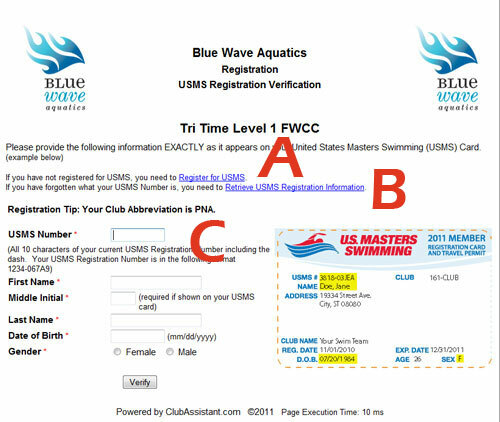 This completes our online tutorial of registering for a Tri Time swim lesson or registering for Blue Wave Aquatics. We hope this helps and welcome feedback. Please send questions and comments to info@bluewave-aquatics.com.